The Indigenous people of Biafra, IPOB, has alleged that the Nigerian Army is conducting a stealth genocide war against the people of South East, with the shooting to death two people in Owerri, Imo State on Monday, and abduction of unidentified number of people in Aba, Abia State last night and this morning, including a husband and wife. IPOB called for immediate release without further delay of those allegedly abducted by Nigerian Army, including a husband and wife they kidnapped this morning, and urged the world to take note and not to blame it if it eventually decides to carry arms against the Nigerian Army and other security agencies used to intimidate, harass and kill the people of South East. 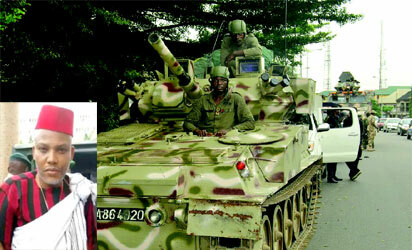 “The Nigerian Army is at it again. Nigerian Army is conducting a stealth genocidal war against Biafrans and it is the responsibility of the world to take note. Yesterday, they shot dead two young men in Owerri. Last night and this morning they have commenced their abduction of Biafrans in Aba. Biafrans are now the longest suffering race in human history. One day the anger will no longer be controllable and the world will wake up then to start pontificating. Contacted for Army reaction, newly promoted Director of Army Public Relation, Col. Sagir Musa, requested for a text of the allegations by the IPOB against the Nigerian Army, and was obliged with a copy of it. However, as at the time of filing this report, Col. Musa, who was the Deputy Director, Army Public Relations 82 Division, Nigerian Army Enugu, has not responded to the allegations.